Credit: A. Sirohiwal, V. R. Hathwar, D. Dey & D. Chopra, ChemPhysChem, 18, 2017, 2859-2863. The X-rays carries an invaluable source of information when applied to the chemical systems. Various X-ray based techniques are used nowadays in chemistry, for e.g. X-ray absorption spectroscopy, X-ray diffraction (Single crystal and powder) etc. The technique of X-ray diffraction is widely pursued by various disciplines of science to obtain the 3D crystal structure of a substance, where otherwise is hard to obtain. Many scientific and technological developments in the past have made this technique robust and trustworthy. In many areas of science, for e.g. molecular dynamics, computational chemistry, etc. one needs a crystal structure of the compound to perform calculations and subsequently do an analysis of the structure-property relationship. In order to obtain better structures, one needs high-quality single-crystals, without which the chances of getting ‘good chemical structure’ are scarce. But, what if the compound does not crystalizes at all? The technique of in situ cryocrystallization helps to determine the structure of such compound which are liquids at room temperature. With this procedure, the liquid is crystallized under non-ambient conditions (Cryogenics using liquid nitrogen) until the morphology is suitable for further collection of diffraction data using the technique of Single Crystal X-Ray diffraction (SCXRD). Further refinement of data provides the invaluable information about the chemical structure, crystal packing, various involved inter and intra-molecular interactions, which directly governs the physical and chemical properties of the liquid. The art of in situ cryocrystallization begins with the cooling of liquid (in a capillary tube) to obtain a crystal, where the growth is monitored by the temperature. The cooling of the liquid well below its melting point gives a polycrystalline phase, subsequent steps include raising the temperature to just below the melting point, this process is conducted in an iterative manner to obtain a high-quality crystal with the careful control of the temperature changes. More importantly, this technique needs different experimental and instrumental settings than conventional SCXRD, and some patience too! There are various reports on the application of this technique applied to low melting solids, ionic liquids etc. However, recent work from our group successfully described the crystal structure determination of organometallics compounds, namely cyclohexadiene iron(0)tricarbonyl complex and methylcyclopentadienyl-manganese (I) tricarbonyl complex. There are reports that these compounds are important in various chemical applications. Interestingly, the chemical analogs of these compounds are solids at room temperature, which makes these compounds potential candidates for further understanding of bonding features with implications in reactivity and catalysis. Once the crystal structure was established successfully, the chemical bonding between the different metal-ligand interactions was established from the quantum theory of atoms in molecules. The importance of the synergic effect, which involves the donation from the carbonyl group to the metal center and back donation from the metal to the anti-bonding orbitals of the carbonyl group is explained from this study. Furthermore, Dewar-Chatt-Duncanson model which explains the interactions, involving π-ligands, from the ligand to metal and back donation to the ligand is also well established from such studies. The importance of weak intermolecular interactions which hold the molecules together in the crystalline solid can also be established. Such studies can be extended to cover a range of organometallic compounds, including lanthanides and actinides and a systematic investigation of the heuristic elements of chemical bonding can be firmly established. 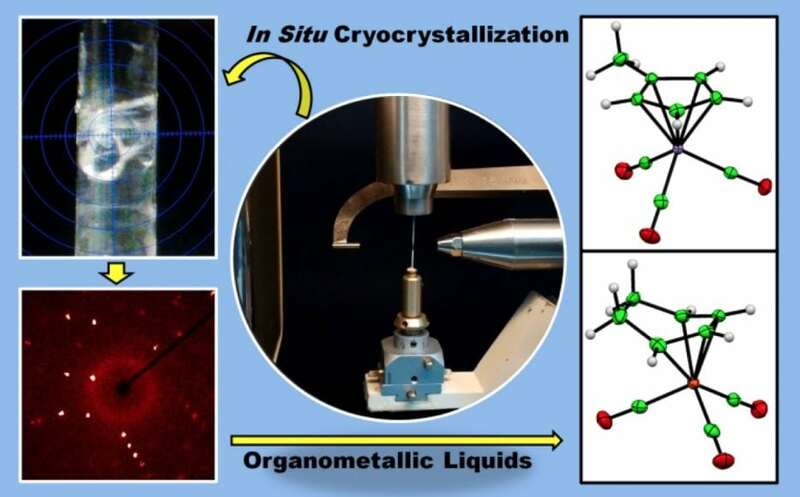 This study, Investigation of Chemical Bonding in In Situ Cryocrystallized Organometallic Liquids was recently published in the journal ChemPhysChem. Deepak Chopra is an associate professor and Doctor of Philosophy at Indian Institute of Science Education and Research Bhopal | IISER · Department of Chemistry.